To the untrained eye, the Craps table is an enigma surrounded by screaming zealots. But once you learn the bets, and the odds involved, it becomes a goldmine of betting strategy and potential profit. The most common bet on the table, available on the opening ('come out') roll: when the black laminated marker labelled 'off' is on the table. Pays if a 7 or 11 is rolled, loses if 2, 3 or 12 are rolled, and any other numbers become the point. Bet stays until either the point is rolled again (you win), or a 7 is rolled (you lose). 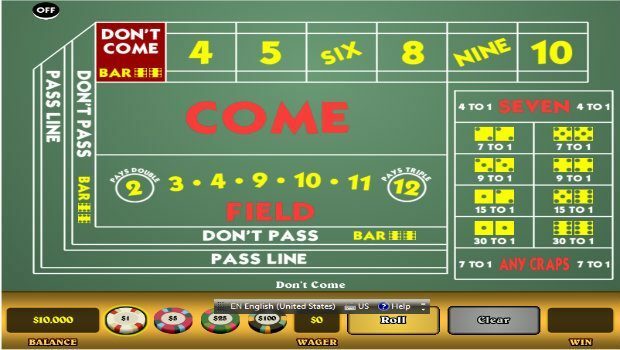 The 'Come' bet is a mathematically identical bet, made after the come out roll. Backs the players by betting on a 7 being rolled. Pays in the reverse circumstances to the 'Pass' bet. 'Don't Come' is mathematically the same as a 'Don't Pass,' but made after the come out roll. Backing the house by betting on a 2, 3 or 12 being rolled. 'Taking the Odds' means backing the point after it has been thrown. Bets are often limited to a percentage of your initial stake on 'Pass' or 'Don't Pass'. The reverse of taking the odds. Place numbers are 4 to 10. You win if your number appears before a 7. Backing the 7 to land before your chosen number. Players are normally charged an extra 5% commission on these bets. Like a place bet on 6 or 8, but with worse odds. A bet on the next number rolled. Options are 2, 3, 4, 9, 10, 11 or 12. Like a field bet, but on rarer numbers. A hard roll is where both dice show the same number. So 'hard 2' is a 1 on each dice, 'hard 4' is two 2s, and so on. By backing and laying various bets, players can customise their own level of risk and reward. Try for yourself online at InterCasino.